Welcome to the family: LinkedIn Salary. Who is LinkedIn Salary for? Bookmark this page on your web browser: LinkedIn Salary. Over time, more and more data will become available, including bonus and equity data for specific job titles. What insights are available in conjunction with salary? The insights available are based on member input. Also, remember this product is in its infancy. For example, at the time of this post in the screen shot below, I searched for Sales Manager salaries in the Greenville, South Carolina area and the data provided is based on only 42 LinkedIn members within the last 12 months. LinkedIn Salary is included in a LinkedIn Premium subscription. However, if you are a basic/free member, you can purchase LinkedIn Salary for $29.99 per month. The current plan is to roll LinkedIn Salary out globally in 2017, but today it is available to LinkedIn Premium members in the U.S., Canada and U.K. If you are sourcing, recruiting and hiring top talent, make sure the compensation you are offering potential candidates is competitive. Keep your eye on LinkedIn Salary as another tool to stay relevant. Be more prepared to talk about your earning potential when you go through the interview process. Use LinkedIn Salary in combination with Glassdoor (although, I foresee LinkedIn Salary replacing it soon) to prepare the ‘money conversation’ with your future employer. LinkedIn’s hot new product has rolled out! LinkedIn Learning has officially opened its virtual doors a year and a half after LinkedIn’s acquisition of Lynda.com. With more than 9,000 courses and 25 new courses added every week, LinkedIn Learning is aiming to be the preferred eLearning portal to close the global economy’s skills gap. This focus attributes itself perfectly to LinkedIn’s vision of developing the world’s first economic graph. To start, LinkedIn Learning is offering its courses in English, but Spanish, French, Japanese and German are in the development queue. As of the publishing of this post, LinkedIn Learning is available to individuals and organizations with 5+ employees. Have you used your free trial of LinkedIn Premium? If not, give it a try and get access to LinkedIn Learning while you are at it. Make sure you also know the other features you have access to with your Premium subscription so that you can make the best use of the trial. 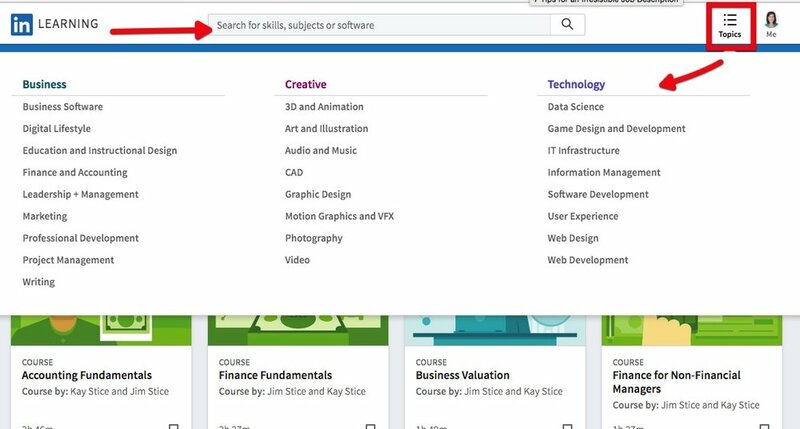 To access LinkedIn Learning from LinkedIn.com, simply hover over Interests and click on Learning from the drop down menu. LinkedIn Learning will populate in a new window. I recommend bookmarking this page so you can easily access it in the future. LinkedIn Learning wants to recommend the courses best suited for you. So, it is recommended that you manually add skills and subjects that are most important to you. Topics are accessed via the top right corner of LinkedIn Learning and are divided into three main categories: Business, Creative, and Technology. Upon completion of a course, LinkedIn Learning will give you the opportunity to add the course and associated skills to your profile. You can also add this information manually later. Another option is to share with your network via a posted update that you completed the course. The interface is incredibly intuitive and allows you to see courses in progress, saved courses, completed courses, and the skills you have selected as important to you to develop. As one of LinkedIn’s ten mobile apps, you can also install the LinkedIn Learning mobile app to have quick access to tutorials when you are on the go. Note: As of the publishing of this post, Sales Navigator does not include access to LinkedIn Learning. Don’t agree with that? Tell LinkedIn via the feedback button on the bottom right corner of your LinkedIn.com account. Companies are not only vying to attract extraordinary talent, they are also competing to retain the current top talent they have today. LinkedIn Learning can be the new differentiator between who is staying and who is going to your organization. All content is curated and conveniently accessible. Here is a current list of the content library within LinkedIn Learning for organizations. Why should organizations consider using LinkedIn Learning? Which groups are a good fit for LinkedIn Learning? LinkedIn Learning appears to be a great launch for LinkedIn with tremendous potential to truly make an impact on the professionals and organizations that embrace it. Have you tapped into it? What do you think?